Come along and hear the current Randell Cottage writer-in-residence David Fauquemberg talk about his writing, his travels, impressions and insights gained so far from his time here in New Zealand. About: David immerses himself in the country he’s writing about. 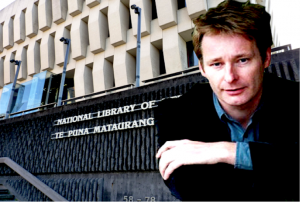 Two years in Australia were the inspiration for his first novel, Nullarbor, (Hoëbeke, 2007), which won the Nicolas Bouvier Prize for Travel Writing. Mal tiempo (Fayard, 2009), which has a boxing theme and is set in Cuba, was awarded the Millepages Prize, the Prix des Hebdos en Région Prize and the City of Caen Prize. His most recent novel Manuel el Négro, published by Fayard in 2013, is the result of a long stay in the world of Andalucia’s flamenco gypsies. — access via the side entrance on Aitken Street. Entry to the event is free, but a gold coin koha to the Friends of the Randell Cottage would be appreciated. Tea/coffee will be available from 5.30pm. RSVP to Robyn Skrzynska at robynskrz@gmail.com not later than Monday 11 May. 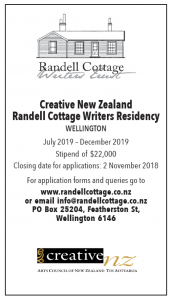 The evening is being held under the auspices of the Friends of the Randell Cottage, The Randell Cottage Writers Trust and the National Library.